FBD Holdings (ISIN IE0003290289) – A local Irish Insurance champion for sale ? Although FBD Holdings, the Irish P&C company looks interesting, I will not invest. The company has a very impressive track record, but in my opinion the business model is not scalable as it doesn’t have any structural competitive advantages besides a loyal client base. 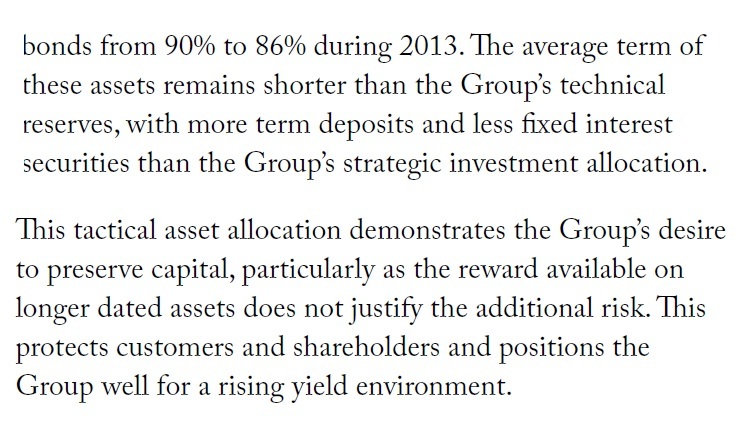 Additionally, the company severely screwed up their asset allocation and will be faced with ultra low investment returns going forward unless they are increasing their investment risk significantly. At current stock prices, the company is in my opinion pretty well priced, with only a relatively small upside in a good case and equally large downside in a more negative case. FBD is an Ireland based Insurance company. It was founded in 1969 by local farmers and has since then grown into the third largest Property and Casualty insurer in Ireland with a market share of ~13% (see this report for detailed market statistics). Wexboy had a good post on FBD in 2012 and why it looked like an attractive company to invest in. Why has the stock dropped so much ? So what happened ? Well, 2014 turned out to be a pretty bad year, both for the Irish Insurance industry and FBD in particular. The weather, which is outside the control of an Insurance company was spectacularly bad in Ireland for 2014. Combined with more traffic accidents, FBD had to issue 2 profit warnings in 2014 and is now expecting to make an operating loss in 2014. Increased economic activity leads to higher claims frequency and there is invariably a time lag before this is reflected in market premiums. This will have a short-term impact on profitability in 2014 and the early part of 2015. Normally, such a situation is a very good entry point for a typical P&C insurance company as it is always good to by in the bottom of a cycle and/or AFTER large claim events. This is the reason why I decided to digg deeper. However what maybe spooked investors was the fact that they had to increase reserves for the years 2011 and 2012, which is normally not a good sign. When looking at P&C insurance companies, the most important point to look at is reserving. When a severe accident happens, an Insurer has to estimate what all the payouts in the future may be. For a permanently disabled young person, this might mean 50 years or more of medical bills etc. So a lot of assumptions have to go into the discounted amount which has to be expensed and shown as a claim in the year the accident happened. An aggressive and irresponsible company can estimate for some time very low claims and show low claim ratios and overstate profits, whereas a conservative company would typically reserve more than needed and then “release” reserves over time. Therefore stated claims ratio would normally be too high. 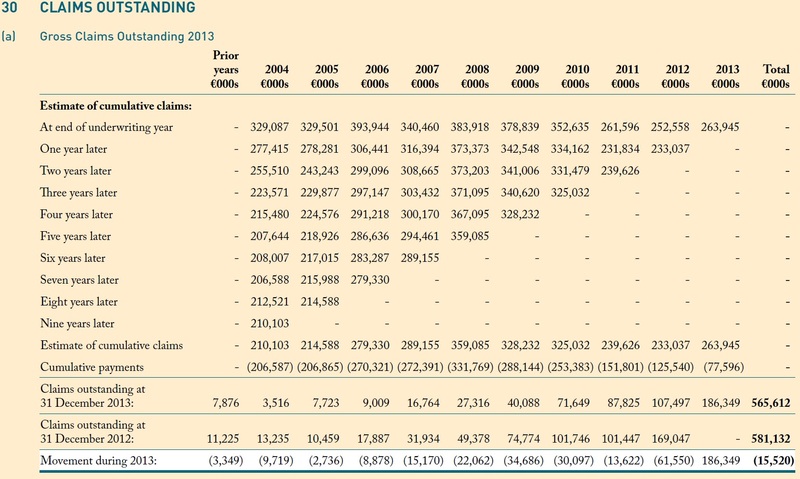 For the underwriting year 2004, FBD initially estimated that they will have to pay 329 mn EUR in claims. Now 10 years later, they have paid out 206 mn with ~13 mn claims remaining. So actual claims (219) were only 2/3 of initially reserved claims. This was VERY conservative. We can also see that reserve release came pretty quickly over the first three years for this underwriting year. Moving forward in time w can see that reserving became a lot less conservative in later years. The change came, surprise surprise, in 2008 when coincidently a new CEO came into the job. Since then, over reserving is only minimal. If you look for instance to underwriting year 2011: Two years later (in 2013) they had to increase already reserves for that underwriting year, something which has never happened before. I have added one line here which for me is quite important: This is the percentage of run off result which comes from the “old stuff”, reserves more than 3 years old. Normally, with a short-term business like FBD, within 2-3 years it should be pretty clear what the final outcome should be. But a cautious CFO will still retain some reserves in old years in order to release them and “smooth out” claims ratios if he needs to in a really bad year. What we can see in the table is that 2013 was already a relatively bad year and FBD did use some of those “old” reserves to smooth out 2013 claims. So 2014 doesn’t look like such a “one-off” either. The explanation could be that they aggressively grew in motor in 2013 and most likely outside their traditional client base with much more price sensitive clients. So a quick summary with regard to reserving: Reserving looks still oK, but a lot less conservative than in the past and some issues already showed up in 2013. One will have to watch closely how the run off looks in detail for 2014 but it seems that their “hidden reserves” are used up and they cannot smooth out claims ratios any more. Translated into normal language this means: We were betting that interest rates would rise but we lost. This is something many insurance companies did, so FBD is not alone, but it clearly shows that they don’t have any above average investment skills. This is one of the most puzzling things in the insurance industry for me. Many insurance executives seem to see themselves as a kind of “interest rate super expert” but in reality they are one of the most pro-cyclical investors out there. With a combined ratio below 100%, FBD could fund the running business fully out of financial year premiums, so they have no fundamental need for any cash allocation in their investment portfolio. With Draghi’s QE on the horizon, we can clearly assume that past investment returns will not be an indication for future returns. Anything above 3% is clearly unsustainable going forward. With current swap rate at 0,4% and their stated liability duration of 3 years, even achieving 1% looks like a stretch. 5 year Irish Government bonds are at 0,65%, so they need to take some risk to even achieve 1%. They still show 3% “annualized” return in the first 6M of 2014 but I am pretty sure that this is only because of realized gains as they had reduced their stock positions. Due to the short duration, one can pretty much assume that there will be a huge “cliff” in investment returns, either in the second half of 2014 or finally in 2015. This together seems to ensure above market margins, but it is also a problem: Such a kind of competitive advantage is not scalable, unless there is a high potential of farmers who are not yet clients. FBD does not have any kind of “outsider” business model. They employ agents, sell via brokers and occupy a big building in Dublin, Ireland’s most expensive city. So there is no observable cost advantage. And yes, they gained market share in the past, but I think this has a lot to do with the decline and sale of Quinn Insurance, the only other Irish Insurance company. From the current point, if they grow their market share, their combined ratio will become more and more similar to the market which is what we maybe are seeing already since 2013. Assuming further growth with historic combined ratios in my opinion is unrealistic. Even assuming historic combined ratios with current premiums could be a stretch. Valuing a “pure play” P&C Insurance company is not complicated. You just need to assume a “normalized combined ratio” and a realistic investment return. Assuming very simplistically constant premium (350 mn EUR) and a combined ratio of 90% plus 1% return on the 850 mn investments, the shares could be worth between 12,85 EUR (P/E 12) and 15,70 (P/E 15). For a combined Ratio of 95%, which I think is more realistic, the range wiuth the same multiples would be between 6,50 and 8,15 EUR per share. Personally, I think the current price of 11 EUR is pretty fair, at it is pretty hard to estimate what COR FBD is able to achieve going forward. I would hesitate to price in any growth as there is no observable competitive advantage. A strategic buyer might pay a premium, but I think it is unlikely that the farmer’s cooperative will sell. The CEO already gets a fair amount of bonus if the stock performs in line with the index and achieves an average combined ratio. The main bonus driver seems to be increasing market shares. Increasing profits or even achieving a certain return of capital is not part of the goal setting, which is very strange for a financial company. To me, the function of this bonus plan is to make sure that the CEO gets his bonus, not to align him with shareholders. For financial companies, as we know from the past, long-term alignment of management and shareholders is extremely important, which makes FBD look quite bad in this respect. Solvency 2: In a nutshell, Solvency II is good for large diversified (P&C plus Life/health) multinational insurance groups and bad for small local “pure play” companies. If you are a local pure play like FBD and your competitors are well diversified multinationals like Aviva, Zurich etc. then you have a problem. Those guys will need a lot less capital to run the business which will drive down ROEs over time. For FBD this means: Say Good bye to 20%+ ROEs for the future, they can be happy if they achieve double-digit ROEs on average going forward. My prediction is that over time they will be forced to merge with some international company but this might take a while and some pain. They do show results of a financial services segment where they do some additional kind of broker services etc. Normally this is pretty profitable business but at FBD this hardly breaks even. My assumption is that they shift costs from the insurance side into this segment to make the cost ratio look better. FBD in principal has a good business but not a great business. Strategically, they are in a difficult situation. They have a stable, highly profitable niche business with local farmers and try to grow in the more competitive overall market. For the overall market, they don’t have a clear competitive advantage which in my opinion puts doubts on the value of the market share increases. Additionally, they will have issues under Solvency II as their capital requirements will increase much more than for the diversified multinational competitors. What really makes them “uninvestable” for me is the totally “out of control” asset allocation strategy, betting the house on interest rate increases since 2012 which clearly backfired massively. The opportunity cost of this decision is massive and would have gotten fired the responsible manager in most other financial companies. So “no buy” for me at current prices (11 EUR). I would look at the stock again at the lower end of my valuation range of 6,50 to 15,50 EUR per share. I came across your blog a couple of months ago and I have been following it since. I really like the way you analyze things and justify your thoughts / opinions. Keep up the good work and thanks for putting so much interesting information about finance and stocks out there. I am currently trying to understand what makes up a great insurance company, and your posts about this topic have been really helpful. They are really instructive and well thought. One of this post is the current one. I read it recently and spend some time calculating the parameters you mention in it, but I was not able to obtain the run-off results. In the text, you mentioned that it took you some effort to calculate these values, but that you still managed to do it using the annual report. Could you please tell me which items you use to calculate this value and how you did it? I know you posted this a couple of years ago, but it is possible that you still remember / know how you did it. Kudos on your blog and besten Dank im Voraus. It seems like the stock is reaching the lower end of your valuation range. I am curious what you think now. The stock is definetely cheaper now. With the CEO gone, one has to look and wait I guess. Results wil not be good, but this could be a good chance. Let’s see, no need to hurry. nice writeup. Since you say that “What really makes them “uninvestable” for me is the totally “out of control” asset allocation strategy, betting the house on interest rate increases since 2012 which clearly backfired massively. The opportunity cost of this decision is massive and would have gotten fired the responsible manager in most other financial companies.” I’m curious what you think would be the best investment/capital allocation strategy for an insurance co. which has its underwriting/reserving in order, and also assuming no Warren Buffett at the helm. Just duration matching assets/liabilities? Include a diversified list of blue-chip stocks? Or fixed income only? And as a “bonus” question, what do you think is the inherently more attractive business model. Banks or P&C insurance? with regard to asset alocation: For an insurance company with average investment skills, they should duration match liabilities and return any excess capital to shareholders. Why would you want them to “play the markets” if the do not generate value with this ? You want an insurance company to focus on insurance and not on market timing etc. Banks/ P&C Insurance: All other things equal, i would prefer a well managed P&C insurance company to a well managed bank. The insurance business model is inherently more stable as you get the money upfront. Excellent introduction to the insurance business, but could you please explain better the following passage? How do you arrive at earnings/share (€1.05?) from your assumptions? the “formula” is simple: (350*0,1)+(850*0,01) minus 15% tax, divided by numer of shares times P/E. When looking at the table I would have taken the 3.5 mm as claims remaining. You are right, I have mixed it up with the 2012 line. 3,5 mn is correct.